Francis Loves Flowers Original Art Black Cat L, M or S Tote Bag, Printed on Both Sides! Announcement Welcome to my shop! If you have any questions, feel free to message me! I am happy to do custom orders for you! Welcome to my shop! If you have any questions, feel free to message me! I am happy to do custom orders for you! Woman and Black Cat Mini Art Print, Framed or Unframed, 3" x 4"
Voices: Challenging the Negative Talk of Anxiety Mini Art Print Framed or Unframed, 4" x 3"
Radiance, Peacock Mini Framed or Unframed Art Print 3" x 4"
One True Friend Mini Framed or Unframed Print 3" x 4"
Day of Acceptance II Self-love Art Print Woman and birds in Meadow 16" x 32"
Voices: Challenging the Negative Talk of Anxiety Art Print 24.1" x 24"
Amaranthine, Cat and Woman Canvas Print, 4 sizes to choose from! 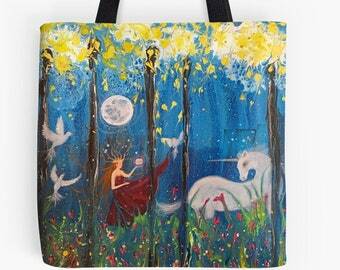 Woman and Unicorn in Forest Original Art Tote Bag, Choose from 3 Sizes! Printed on Both Sides! 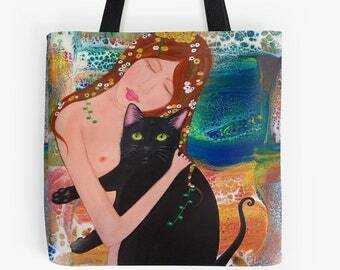 Black Cat and Women Original Art Tote Bag, Choose from 3 Sizes! Printed on Both Sides! Enchanted Paths, 12 Original Art Paintings 2019 Large Wall Calendar, Great Christmas Gift, FREE SHIP in US! 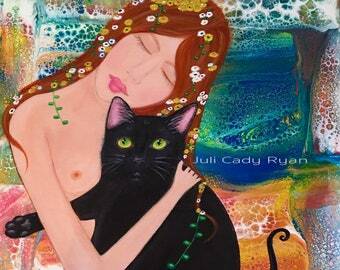 The Peace Within Her Soul Girl and Cat Whimsical Fantasy Print, Choose from 6 Sizes! 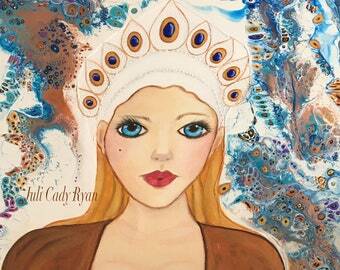 Fierce, Beautiful Russian in Woman Headdress Original Fantasy Art Print, Choose from 6 Sizes! 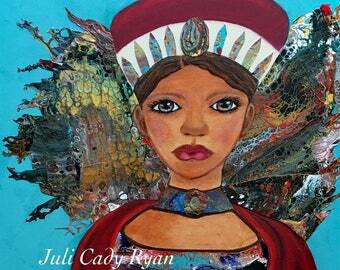 Indomitable, Beautiful African Woman in Headdress Original Fantasy Art Print, Choose for 6 Sizes! 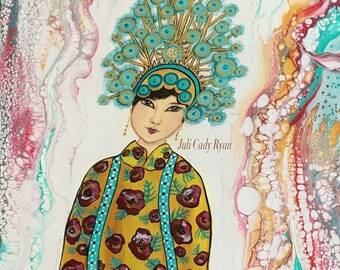 Victoress, Beautiful Chinese Woman in Headdress Fantasy Art Print, Choose from 6 Sizes! 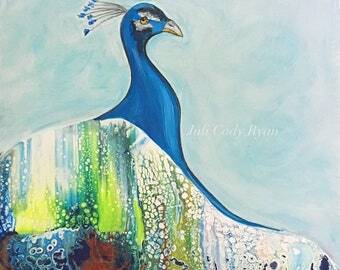 Radiance, Peacock Original Colorful Art Fantasy Print, Choose from 6 Sizes! 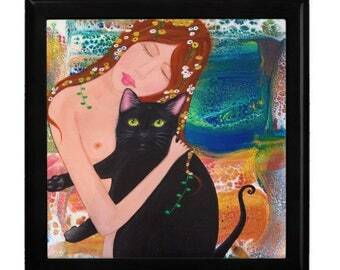 Amaranthine (meaning unfading, immortal), Black Cat and Woman Fantasy Klimt-style Print Choose from 6 Sizes! 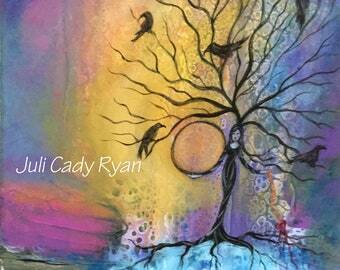 Soul Searching Woman is a Tree with Birds and Waterfall Fantasy Print Original Art Choose From 6 Sizes! 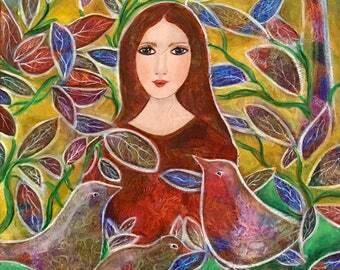 Kairos, Fantasy Unicorn, Woman and Doves in Forest Print, 6 Sizes to Choose From! 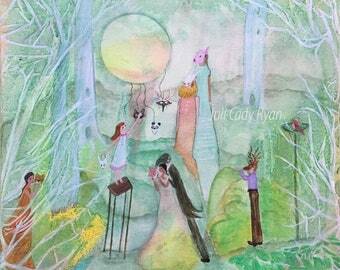 Sleep Fairy and Her Magic Sheep Original Children's Bedtime Story with My Art Illustrations, Option of a Signed Copy! Lovely, colorful design! Speedy shipping. Thanks. Glad you stopped in to learn more about me and my art! 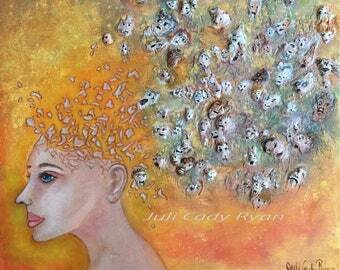 Two Minds, one of my most meaningful paintings, expressing my daughter's struggle with mental illness. This was where I started painting 12 years ago...in my kitchen! Sometimes a furry friend joins me! My art tells the tale of hope, when there should be none...light when there should be darkness. Faith that tomorrow will be better. Today, Juli lives in Cincinnati, OH with her husband, Sean and her two black cat, Lordie and Francis. Her children are all grown and also live in Cincinnati. 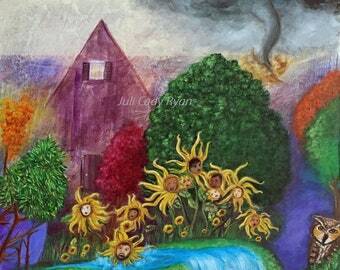 Juli hopes to continue painting and sharing her family's story to be a voice for mental illness. 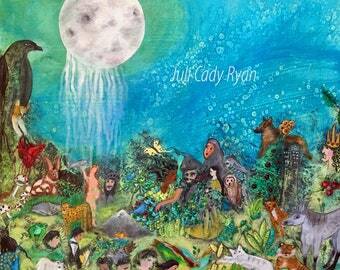 I'm an artist who wishes to create a world where love, peace and joy are victorious. A husband and wife team that grew their small business in a short time and have even been seen on the national morning shows! I have been working with the Bagettes company for many years and love their products! In 2006, Eileen Gittens created Blurb because she wanted to publish her own book, but found it was too expensive. Blurb creates quality books at affordable prices. I have worked with Blurb for years now and love their services! It all started in 1999. That idea - to apply printing & technology innovation to make it easier for the world to express themselves. Imagekind produces many of the giclee prints I sell here on Etsy. The images I upload to their website are printed on large variety of substrates (including canvas and paper) using Epson large format Ultra-Chrome inkjet printers. A small company that does big things! With great customer service and a beautiful job printing art prints, cards and calendars, RedBubble has won me over! Society 6 is a print on demand company that I recently have started using to print and ship my products. I look forward to working with them! Zazzle is a marketplace where people can buy and make anything customized from iPhone cases to shirts. Zazzle has a manufacturing facility in San Jose, California. I love creating my art and I will do the very best I can to make sure you are happy with your product!!! Please contact me immediatley if you are not satisfied with your purchase. Please don't leave negative feed back without consulting me, so I can take care of the problem first. Please explain in detail what the problem is, so I will know exactly how to remedy it. Just saying you are unsatisfied won't help me fix the problem or move forward and do better. I need to know what I can change. My goal is to make you happy:) I will refund your money if returned within a week, but only if I cannot offer you another option, like another product sent to you. Immediate payment through Paypal or credit card is required. Or you may use Direct Checkout with a credit card. All the shipping estimates are stated on the product's page. I use several different manufacturers and each product is different, so please look it over before purchasing. If you like a certain image of my art and want that image on a product you see here, let me know. I can customize many of the items in my shop. For example, if you like a print and would like to see that image on a purse, I can do that as long as the image fits. Contact me about special orders.